This is the eight and final article based on discussion at the 1/22/19 Atlantic Yards/Pacific Park Quality of Life meeting. The first concerned timing for the B15 tower, with school, and the B4 tower. The second concerned questions about the affordability of future income-restricted housing. The third concerned plans to constrict streets around the B15 tower. The fourth concerned plans for the railyard, demolition, and Times Plaza. The fifth concerned an absurdist dialogue about the definition of construction. The sixth concerned NYPD parking; post-event enforcement; ticket distribution, and the Neighborhood Support Team. The seventh concerned the project's health center. 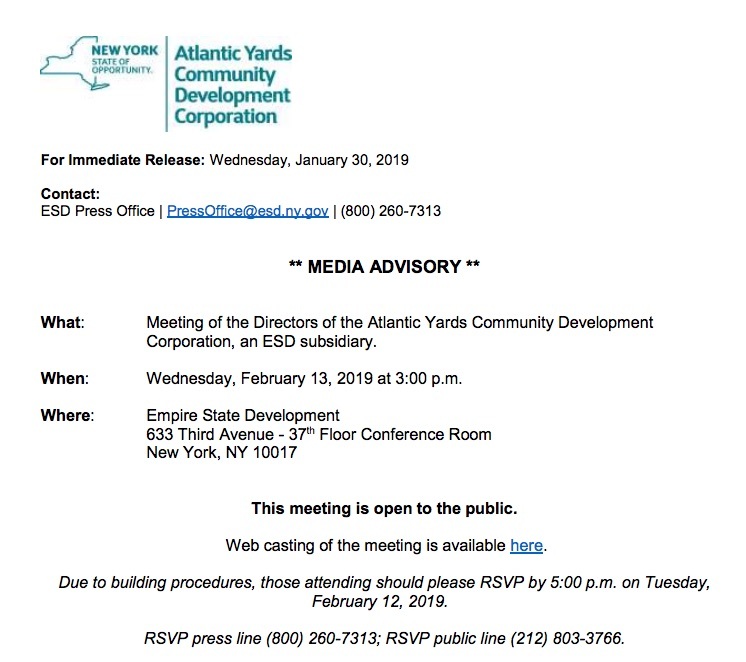 The Atlantic Yards Community Development Corporation (AY CDC) is supposed to meet quarterly and offer advice to the parent Empire State Development (ESD). But it hasn't met since last March--its second meeting of 2018. 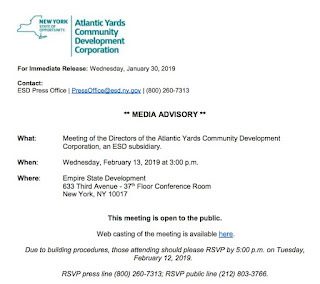 "We are actively working to schedule a meeting," said AY CDC executive director Tobi Jaiyesimi, who also serves as Atlantic Yards project director for ESD, thus essentially helping advise herself. Indeed, since then, an AY CDC meeting has been scheduled for Wednesday, Feb. 13 at 3 pm, as indicated in the screenshot at right. Rather than Long Island University in Brooklyn, a past location for meetings accessible to locals, it will be held at ESD offices, 633 Third Avenue, 37th Floor Conference Room, in Manhattan. RSVPs are necessary: (212) 803-3766 for members of the public. The meeting also will also be webcast. "There was a question about the total of appointees on the board," Jaiyesimi said, referring to questions submitted before the meeting. "Right now we have a total of nine appointees, and the outstanding board appointments would be for the City Council, the Mayor’s Office, and also there are three outstanding gubernatorial appointees… The total... is updated and available on the AY CDC/ESD web site." "You didn’t mention Assemblymember [Walter] Mosley, doesn’t he have an appointment?" asked resident Peter Krashes, perhaps knowing the answer. “He does have an appointment,” Jaiyesimi responded, with something of an "a-ha" air, as if acknowledging she'd glossed over something. “The wonderful Gib Veconi has been appointed to the AY CDC board, and so the Assembly appointment has been filled." Veconi, long associated with the Prospect Heights Neighborhood Development Council (PHNDC) and the BrooklynSpeaks coalition--which had a posture toward Atlantic Yards, in my summation, of "mend it, don't end it" (in contrast with project opponents)--helped negotiate the 2014 settlement agreement. That imposed a new 2025 deadline for the project's affordable housing--after a previous extension until 2035, which itself had come after longstanding promises of a 10-year buildout--as well as the advisory AY CDC. At the same time, signaling some schisms in Prospect Heights, the Dean Street Block Association (with Krashes as a leader), representing the neighbors closest to the project site, left the PHNDC rather than endorse the settlement, believing that the new body wouldn't provide sufficient oversight of untoward impacts, as well as the project in general. It's premature to predict Veconi's performance on the board, but, as someone who's dedicated significant time to advocacy regarding the project, he'll be the best-informed person on the board. He'll thus be best positioned to ask questions of developer Greenland Forest City Partners and also Empire State Development, thus potentially adding rigor to a mostly toothless board. For example, one board member in January 2018 asked a Greenland USA representative for a project schedule and was told it likely would be provided by the end of the year. It wasn't. Veconi also regularly attends community meetings regarding the project, while only a few--now departed--AY CDC members have done so, and only occasionally. He's been most focused on affordable housing--clearly the issue most important to elected officials, with 1,468 more units required--while others press the issue of neighborhood impacts. That said, in a public comment at the first AY CDC meeting in February 2015, Veconi expressed concern that the AY CDC not lose sight of its obligation to oversee compliance with environmental commitments. Also, the PHNDC criticized the huge 80 Flatbush plan, saying that "the experience of neighbors living next to the Atlantic Yards project over the last seven and a half years has not demonstrated that dense, out-of-scale new development is compatible with historic, low-rise residential blocks," warning of the future Pacific Park project at Site 5. I emailed him a few questions, with his responses in italics, and add some comments of my own. 1) How did this come about? Did Assemblyman Mosley go to you, or vice versa, or did someone else make a suggestion? I agreed to serve at the request of Assemblyman Mosley. 2) What's your main goal? What did Assemblyman Mosley ask of you? My goal is to help improve accountability for Atlantic Yards’ public commitments, consistent with the AYCDC charter. The upcoming 2025 deadline for completion of the project’s affordable housing, as well as the expected Site 5 MGPP [Modified General Project Plan], both represent potential opportunities in that respect. I intend to brief Assembly members Mosley and [Jo Anne] Simon regularly on project developments. He was referring to plans for the shift of bulk from the unbuilt tower over the arena plaza, which original architect Frank Gehry dubbed "Miss Brooklyn," to Site 5, currently home to P.C. Richard and Modell's, which would accommodate a huge two-tower project. That project requires approval by ESD, and thus advice from the AY CDC. 3) Did you think, when you negotiated in 2014 to establish the AY CDC, that you could possibly play a role on it? Were you asked back then? At that time, I believed that AYCDC would benefit from a board with members who could bring both domain expertise and a new perspective to the project. Questions for Veconi: a "potential adversary"? 4) Because you were a negotiator, do you consider it a conflict of interest or a way to position you as less of a potential adversary? Strictly speaking, conflicts of interest involve direct or indirect personal financial interest. I don’t believe I am involved with anything that would give rise to such a conflict. An interest in seeing the project meet its obligations does not make me an adversary. I wasn't suggesting financial interest, but broader notions of conflict of interest include self-dealing, so... it would have appeared to some eyes to have been a conflict if a negotiator of the 2014 settlement was then immediately appointed to the AY CDC, since it could've seemed a negotiated condition (even if it's a volunteer obligation/burden). The passage of time may change that equation, especially since few people seem willing to serve, and few are qualified to do so. I'd note that two original appointees were signatories of the Atlantic Yards Community Benefits Agreement, thus clear allies of the developer. That, to my surprise, was not considered a conflict. They both resigned after playing minor roles. Though I don't think that pushing the project to meet its obligations makes Veconi an adversary, if he and others had to go to court to try to enforce those obligations, that would be adversarial. 5) You do still have standing to litigate the failure to fulfill the settlement agreement, right? Does this new role have any impact on that standing? I am a director of the Prospect Heights Neighborhood Development Council, which has in the past been a plaintiff in Atlantic Yards litigation. I am not an attorney, but I would not expect PHNDC’s standing relative to Atlantic Yards to be compromised by my being a member of the AYCDC board. Notwithstanding, I don’t think it’s appropriate or helpful to speculate on potential future litigation at this time. "I'd like to thank all of the directors, as well as Mr. Phillips and Ms Jaiyesimi for your service here on this the board. I want you to know, from the perspective of our community, we really respect the time and effort you're putting in for oversight on this project, and, again, want to thank you." Yes, I believe there have been many shortcomings in the planning and execution of the Atlantic Yards project. Pointing them out is not inconsistent with expressing thanks to the AYCDC board members for serving on a body that is overseeing a complex project, for which service they receive no compensation. True, those aren't inconsistent, but I still think he was being generous, because, however much time the volunteers put it, most haven't learned much about the project. Right before Veconi spoke, a representative of Assemblymember Simon criticized the AY CDC for scheduling a meeting with less than 24 hours' notice, saying it would stifle public input. After the first AY CDC meeting in 2015, I thought that both BrooklynSpeaks and Veconi expressed undue optimism about the new body, calling it a "milestone," without pointing to the conflict of interest involving CBA signatories, among other things. In comments on a Brooklyn Paper article, one person called Veconi a shill for the state authority, which was unfair. I did suggest that it wasn't a stretch "to suggest that the negotiators of the settlement want to portray it in the best possible light." Last March, at that AY CDC meeting, Veconi expressed concern about the goal of reaching 2,250 affordable units by 2025, a question he's raised at other public meetings. At the recent Quality of Life meeting, he honed in on the discontinuity between the affordability promised in the 2005 Affordable Housing Memorandum of Understanding (MOU) signed by original developer Forest City Ratner, asking, "Would it be fair to say that the affordability levels that were stated in the MOU are right now kind of looked at on a best efforts basis by the folks that are going be doing the development?" "It's our hope that we're going to be able to achieve them," came the response from Greenland USA's Scott Solish, essentially endorsing Veconi's framing. So the question remains how much he--and the other members of the AY CDC--will push on this. All "affordable housing" is not the same, we've learned. After the 2014 settlement accelerating the delivery of the below-market units, a BrooklynSpeaks press release--containing approving quotes from various elected officials--quoted Veconi's fellow negotiator Michelle de la Uz, Executive Director of the Fifth Avenue Committee, as saying they'd reached "an agreement with Forest City and the State to ensure the community finally gets the affordable housing it was promised 10 years ago." It was not, we'd learn, the affordable housing that was promised, and the negotiators hadn't been informed that it was significantly skewed to middle-income units. So, the affordability of the next tranche remains a question.